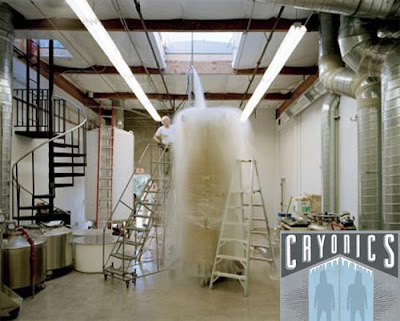 Interlocutor: Does cryonics trap the Thetan somehow? Ruanel: No, that’s something physical... There is nothing in the physical plane that could affect a spiritual entity Since It is in another vibrational plane. Interlocutor: That’s clear, but Does cryonics have some sense to keep the body in suspention until the cure of the illness be achieved? Ruanel: Not necessarily. He can be a person that already had to disembody and they cryonize him to see if in the future they can cure him from a tumor or an illness so that he Could be "revived"
Then that Thetán is in combination in the spiritual world and it’s also important that be recorded. He knows that that body somehow still belongs to him, He is no longer incarnated, not even embodied in the 10%. He’s not trapped, He is free 100% in the spiritual plane that corresponds to him, but he will be waiting in a certain measure to that body. And that body in the future, if the conditions are truly given so that the it could house again his 10% Thetan, he will enter again in that body with his memory. I say with his memory because the cellular pattern, the neurological pattern of that brain will attract automatically as resonance... as well as the twin souls vibrate in resonance, the neurons of that incarnated being, vibrate in resonance with the spirit and then they automatically will attract the spirit. Because that spirit needs to have his memories... we know that the neurons are not really those that keep the memory in the physical plane... They are those that like transistors or chips diagram that memory. Interlocutor: Are we speaking that the crionized body acts like a magneto attracting the spirit? Ruanel: No, it doesn't attract the spirit like a magneto. If supposedly that spirit has a more important mission and the will of beings of Light is there, the cryonized body will never return to life, because it was already decreed in that way. They are going to try to revive the body with any technique and they won't succeed, it won't be life there. Directly the spirit will be waiting, seeing how his embodied brethren are playing about this issue. Interlocutor: Can any other entity get into that body which was from the true owner to say it somehow? Ruanel: No, because the neurons have the aptitude to house exclusively to that spirit, who was incarnated in that body, because they keep the memories. Let’s say that the memory stays in the spirit, because the spirit is the one that has the mind, the body is the one that has the brain, but at the same time, the brain operates in such a way that if at this time... let’s suppose for example that your TV is unique in the world and instead of capturing 66 channels it captures 67... That channel 67 is a special channel that you alone watch... If you break that television, for some reason that channel 67 cannot be transmitted by any other television. Do you understand the point until here? Ruanel: Unless they don't fix your television that channel 67 won’t transmit. This channel 67 would be that Thetan who is waiting to that cryonized body (that would be the TV) returns to life. If that body doesn't return to life, the “channel 67” (Thetan) will change of module and then it will embody in another body, and then the memories will go to the Akashic files. But as long as that body is cryonized, the Thetan will be waiting, but not for something related to a magneto, but because the Thetan wants to. This entry was posted at Wednesday, August 26, 2009 and is filed under Medical Science . You can follow any responses to this entry through the .